CHICAGO, Ill., May 5, 2011 (SEND2PRESS NEWSWIRE) — Illinois foreclosures dropped sharply in the first quarter, reports ForeclosureDeals.com, a leading provider of foreclosure news and foreclosure listings. In addition, new measures to fight foreclosures by the state could lead to higher prices for Illinois foreclosures in the near future, making the foreclosure discounts investors are used to harder to come by. Statistics show that there were 28 percent less foreclosure homes during the first quarter of 2011 then during the same period in 2010. While Illinois still holds the 10th highest foreclosure rate in the nation, Illinois’s foreclosure property market could undergo big changes. A new state Supreme Court decision could also have an effect on the supply of foreclosures in Illinois. The court has established a mortgage fairness committee to review lending and foreclosure procedures in the state, and possibly changes the laws for each. Foxx pointed out that while this is good news for the Illinois housing market, it could mean foreclosure investing in Illinois could soon become more expensive. In an effort to help the Illinois real estate market recover, the state legislature is also considering a bill that would no longer factor nearby foreclosures into a home’s property value. Currently, a foreclosure home in a neighborhood can bring down the value of the homes all around it. The proposed bill would legally change that, which could create a larger divide between the price for a foreclosure in Illinois and the market price for a regular home. 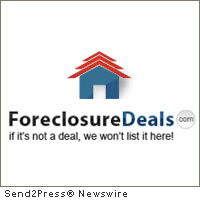 If median home values go up, foreclosures could become more valuable if their price remains depressed. Kendall and Will Counties had the highest rates of foreclosure in Illinois in the first quarter, and experts stress that cheap foreclosure homes are still out there, despite the uncertain market future. Original Keywords: James Foxx, Illinois real estate, Foreclosure Deals, foreclosure listings, REO, bank owned, Chicago, investors, Kendall and Will Counties Foreclosure Deals Chicago Illinois CHICAGO, Ill.
REFERENCES: Chicago Business News, James Foxx, Illinois real estate, Foreclosure Deals, foreclosure listings, REO, bank owned, Chicago, investors, Kendall and Will Counties Foreclosure Deals Chicago Illinois CHICAGO, Ill.